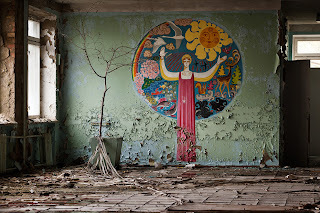 LOS ANGELES, USA -- Internationally-renowned photojournalist Gerd Ludwig has spent years documenting the aftermath of the Chernobyl nuclear disaster. In 1986, errors at the plant in Ukraine led to an explosion that ultimately caused over a quarter of a million people to permanently evacuate their homes to escape the radiation and radioactive fallout. Over the course of several trips to the site and the region for National Geographic Magazine in 1993, 2005, and 2011, Ludwig has amassed a documentary record of a people and a place irreparably altered by a tragic accident. 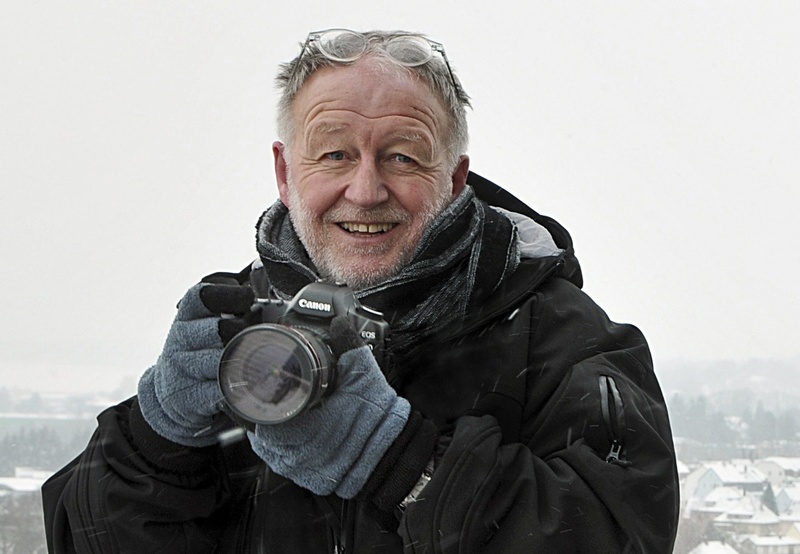 His 2011 trip was partially funded by a Kickstarter campaign. Ludwig has released an iPad app with over 150 photographs, video, and interactive panoramas. Gathered here is a small selection of the work Ludwig has produced over the years of the still-unfolding tragedy. 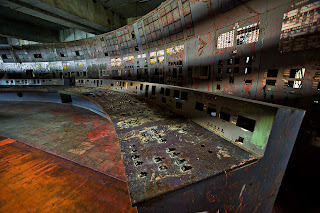 On April 26, 1986, operators in this control room of reactor No. 4 at the Chernobyl Nuclear Power Plant committed a fatal series of errors during a safety test, triggering a reactor meltdown that resulted in the world's largest nuclear accident to date. Today, the control room sits abandoned and deadly radioactive. 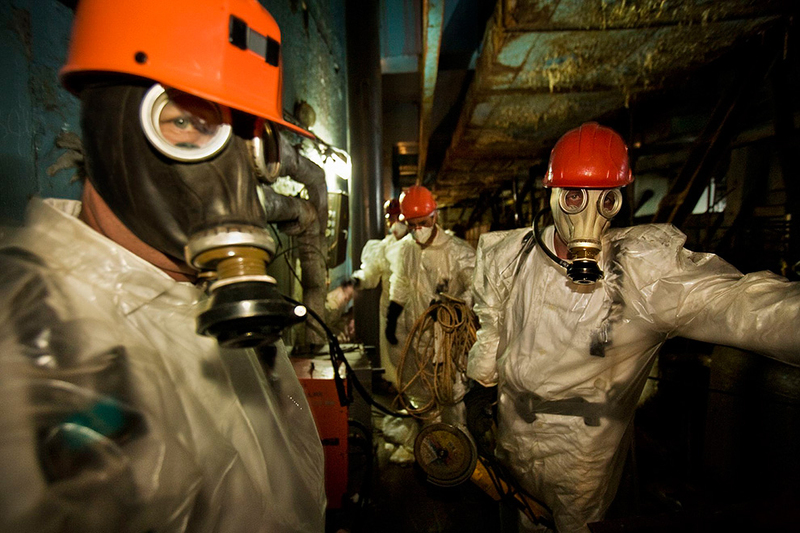 Workers, wearing respirators and plastic suits for protection, pause briefly on their way to drill holes for support rods inside the sarcophagus. It is hazardous work: radiation is so high that they constantly need to monitor their Geiger counters and dosimeters, and they are allowed only one 15-minute stay in this space per day. 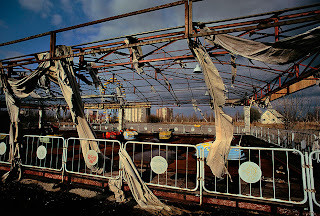 For years desperate efforts were under way to shore up the roof of the shelter to prevent it from collapsing. Inside the sarcophagus, dimly lit tunnels lead to eerie rooms strewn with wires, pieces of shredded metal and other debris. Walls have collapsed, and rubble is covered with contaminated dust. 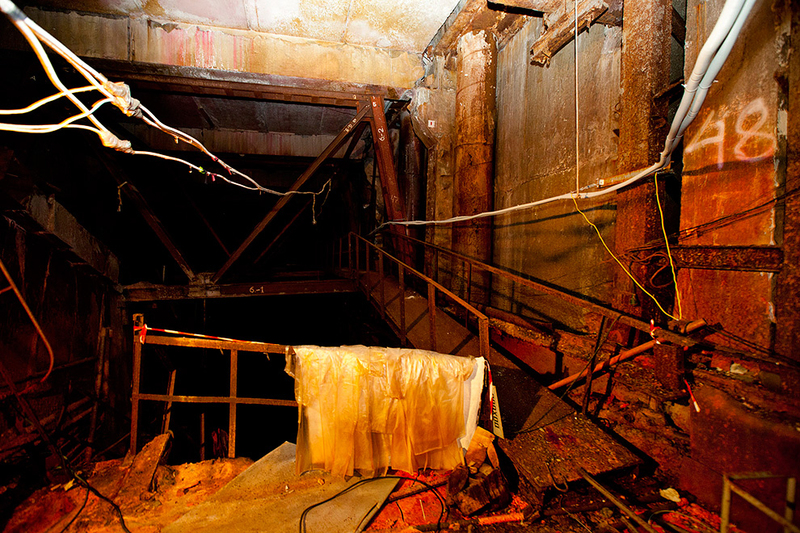 The stabilization work has been completed, and today the reactor’s interior sits untouched and deadly radioactive, waiting to be dismantled. 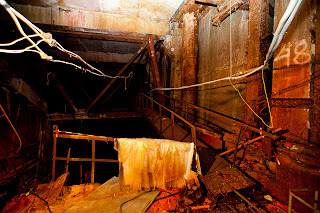 Although radiation levels only allowed for a few minutes of access, workers initially had to pass over hazardous ladders to a section underneath the melted core with life threatening contamination. To facilitate faster access, a daunting hallway called the leaning staircase was erected. 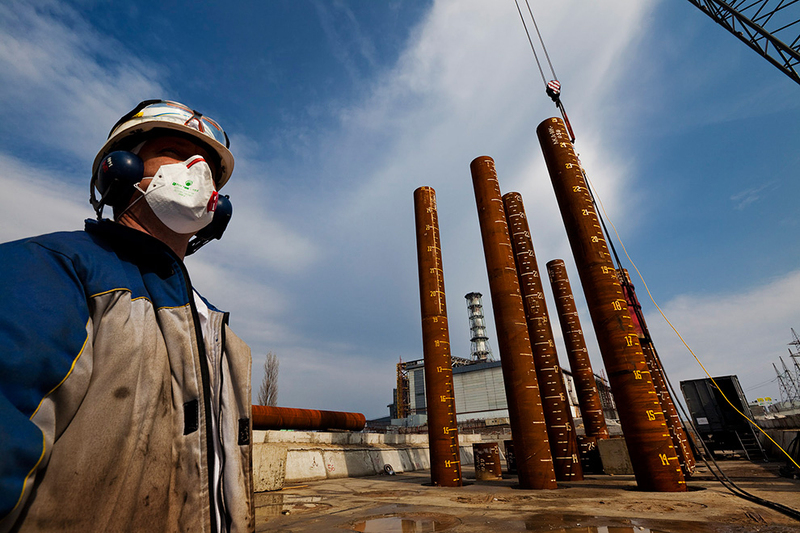 Workers near the sarcophagus expose themselves to hazardous levels of radiation while building the New Safe Confinement, estimated to cost $2.2 billion. The arch-shaped, 29,000-ton metal structure, 105 meters (345 feet) high and 257 meters (843 feet) wide, will slide over the existing structure to allow demolition of the ailing shelter. 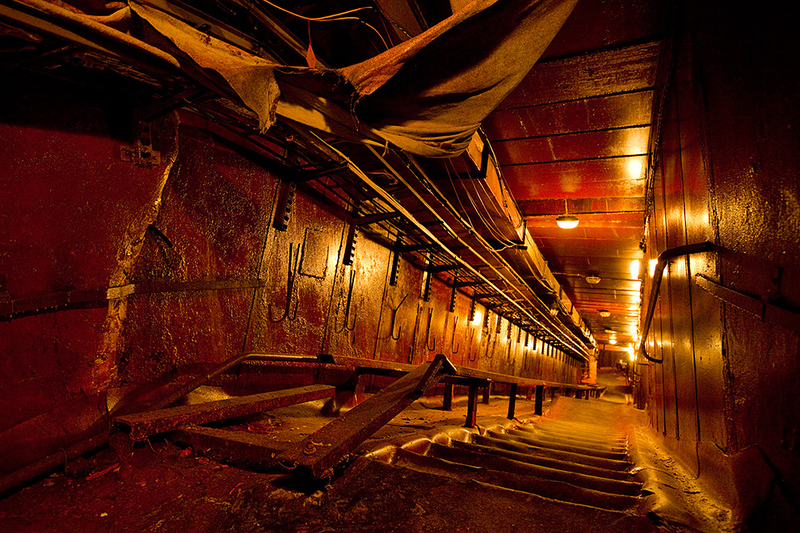 To provide an indestructible base for the new confinement, 396 enormous metal pipes are hammered 25 meters (82 feet) deep into the ground. 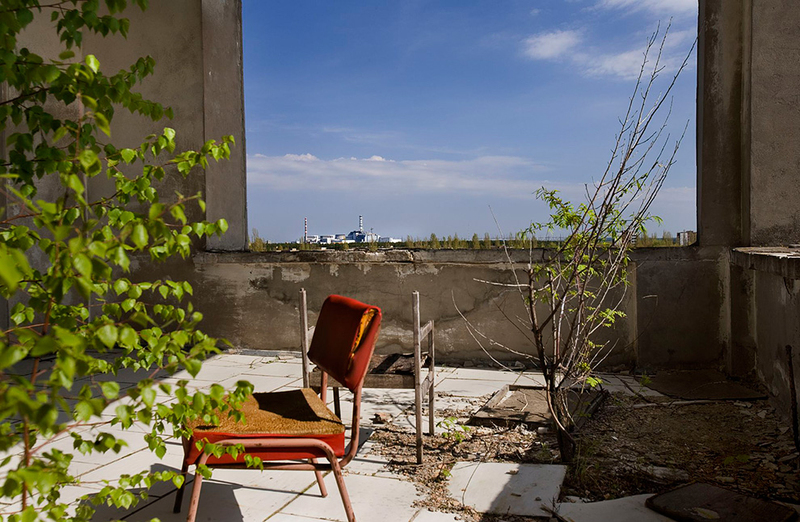 A rooftop view from the Polissya Hotel in the center of Pripyat shows the proximity of the ill-fated Chernobyl Nuclear Power Plant to this former home of 50,000 people. 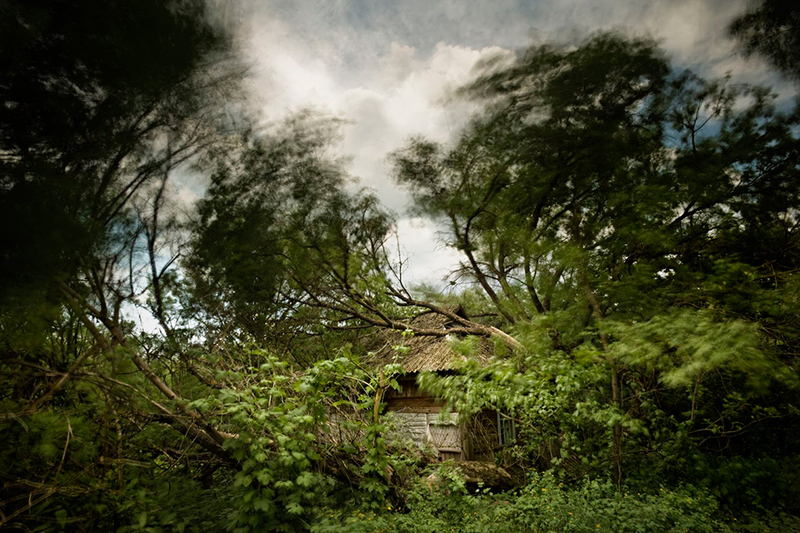 Today, Pripyat stands a ghost town overrun by nature. 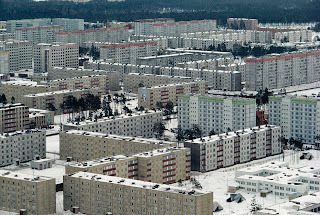 Built in 1970 for the scientists and workers of the Chernobyl Nuclear Power Plant, the city of Pripyat, located less than 3 km (1.9 miles) from the reactor, was once inhabited by nearly 50,000 residents and brimming with life. Authorities did not immediately warn residents of the accident and ordered the evacuation a full 36 hours after the explosion. 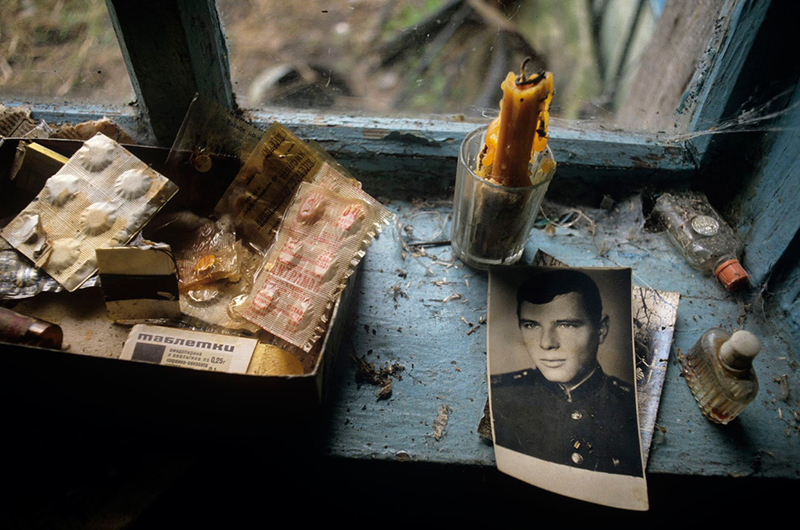 When Soviet authorities finally ordered the evacuation, the residents’ hasty departure often meant leaving behind their most personal belongings. 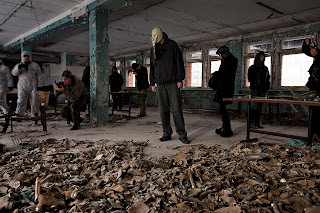 The Soviet Union only admitted to the world that an accident had occurred three days after the explosion, when the nuclear cloud reached Sweden and scientists there noticed radiation on their shoes before entering their facility. Nineteen years after the accident, the empty schools and kindergarten rooms in Pripyat - once the largest town in the Exclusion Zone with 50,000 inhabitants—remain a silent testament to the sudden and tragic departure. Due to decay, this section of the school building has since collapsed. On the day of the disaster, children oblivious to the nuclear accident played in this kindergarten in Pripyat, the reactor’s company town. The following day they were evacuated, leaving behind everything — even their treasured dolls and toys. 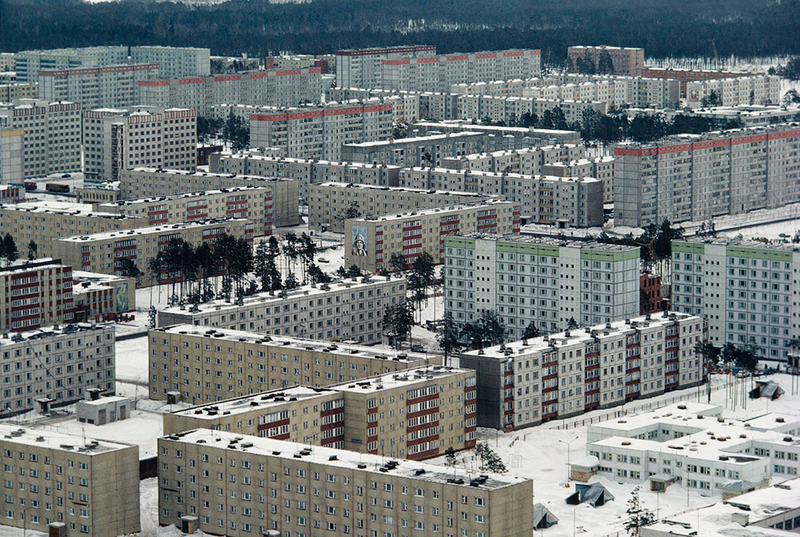 Wind blows through the desolate town of Pripyat. 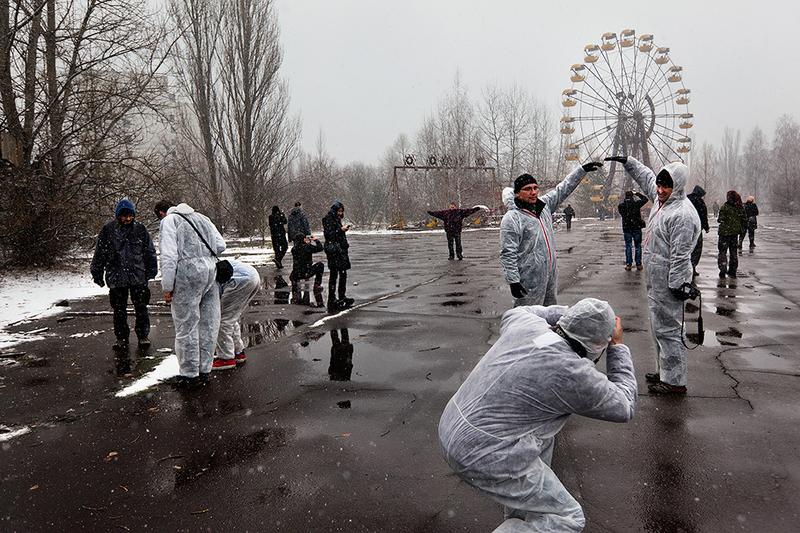 On April 26, 1986, this amusement park was being readied for the annual May Day celebrations when reactor No. 4 of the Chernobyl Nuclear Power Plant exploded less than 3 km (1.9 miles) away. On April 26, 1986, this amusement park in Pripyat with bumper cars and a Ferris wheel was being readied for the annual May Day celebrations when the nearby reactor blew up. 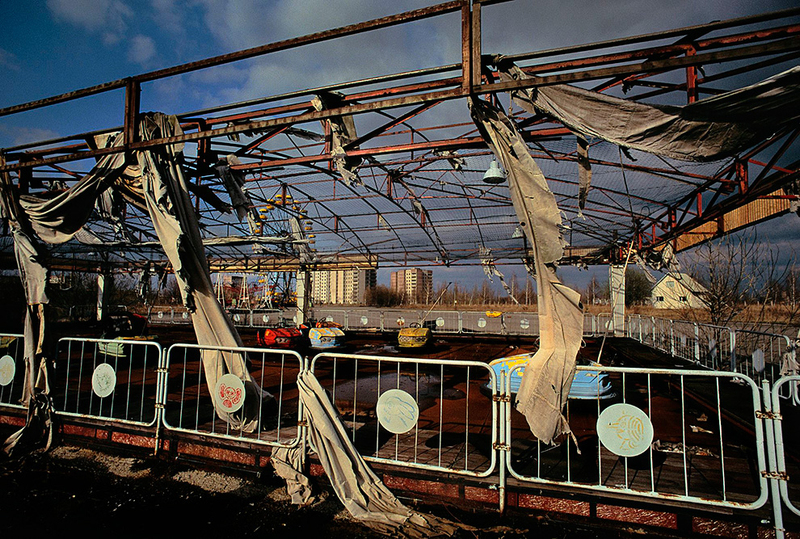 Rotting away for 25 years, it has since become a symbol of the utter abandonment of the area. Now it is an attraction for tourists who have started flocking to the zone in droves. 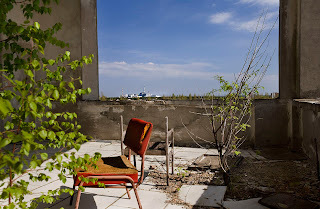 In 2011, the Ukrainian government officially legalized tourism in the Exclusion Zone. 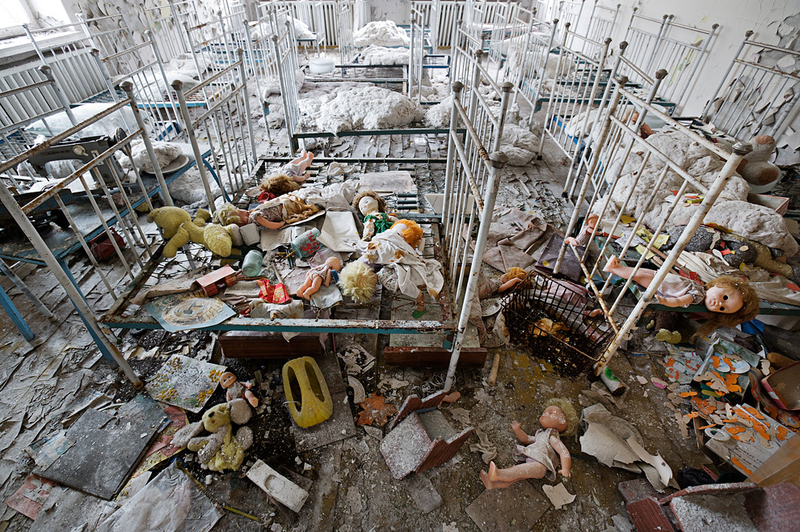 In Pripyat, visitors get to wander through the debris-strewn corridors and empty classrooms of a school. 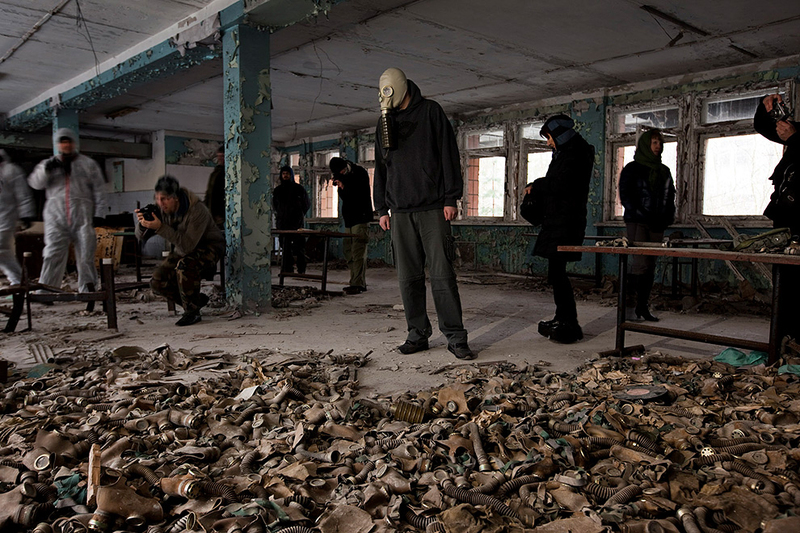 Hundreds of discarded gas masks litter the floor of the canteen. One tourist brought his own gas mask—not to protect himself from the radiation but simply for photographs and giggles. The nuclear accident contaminated tens of thousands of square kilometers, forcing 150,000 people within a 30 km (19 miles) radius to hastily leave their homes. Today, nearly all the small wooden houses in the scattered villages within the Exclusion Zone are abandoned, and nature slowly takes over these remnants of civilization. 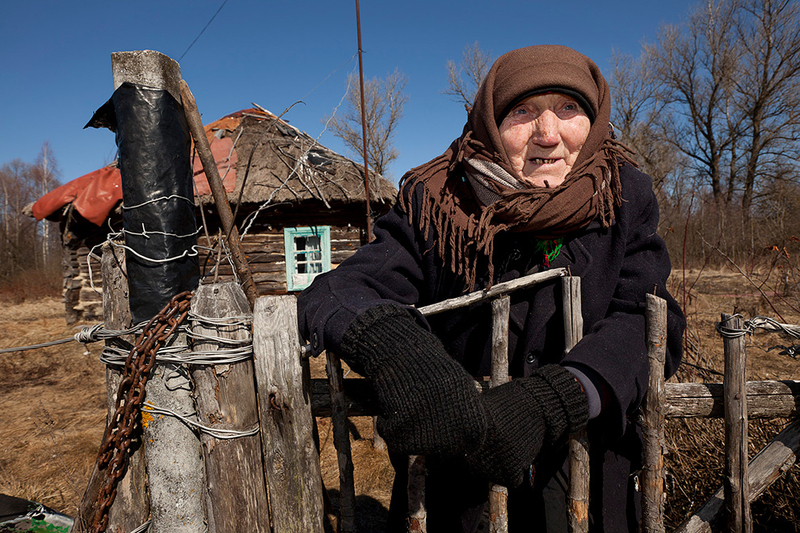 Kharytina Descha, 92, is one of the several hundred elderly people who have returned to their village homes inside the Exclusion Zone. Although surrounded by devastation and isolation, she prefers to die on her own soil. Suffering from thyroid cancer, Oleg Shapiro, 54, and Dima Bogdanovich, 13, receive care at a thyroid hospital in Minsk, where surgery is performed daily. As a liquidator, Oleg was exposed to extreme levels of radiation. This was his third thyroid operation. 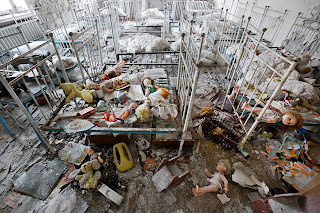 Dima's mother claims that Chernobyl’s nuclear fallout is responsible for her son’s cancer, but his doctors are more cautious; Belarusian officials are often instructed to downplay the severity of the radiation. 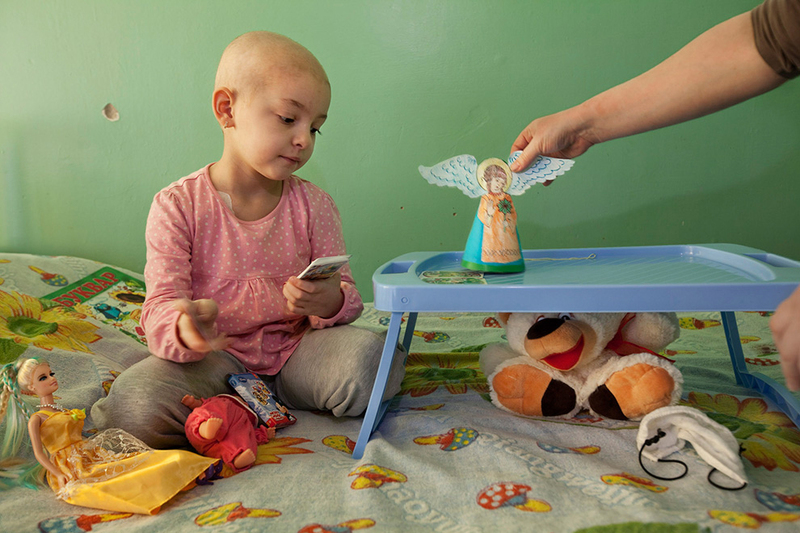 As his mother worries, Dima Pyko, 16, receives treatment as a lymphoma patient at the Children’s Cancer Center (Oncology and Hematology Center) in Lesnoy near Minsk. The facility was built with much financial support from Austria as a direct result of cancers occurring in the fallout regions in Belarus after the Chernobyl accident. Severely physically and mentally handicapped, 5-year-old Igor was given up by his parents and now lives at a children’s mental asylum, which cares for 150 abandoned and orphaned children with disabilities. It is one of several such facilities in rural southern Belarus receiving support from Chernobyl Children International, an aid organization established by Adi Roche in 1991 in the aftermath of the world’s worst nuclear disaster. In the days, weeks and months after the Chernobyl accident, strong winds pushed the radiation released by the explosion northwest into the Gomel region of Belarus, contaminating thousands of square kilometers with the radioactive fallout. Today, girls born around the time of the accident are having children of their own. Many find themselves anxious about the contamination and what it might have done to their reproductive organs and genes. 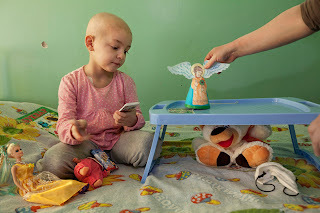 Only 5 years old and suffering from leukemia, Veronika Chechet is hospitalized at the Center for Radiation Medicine in Kiev. 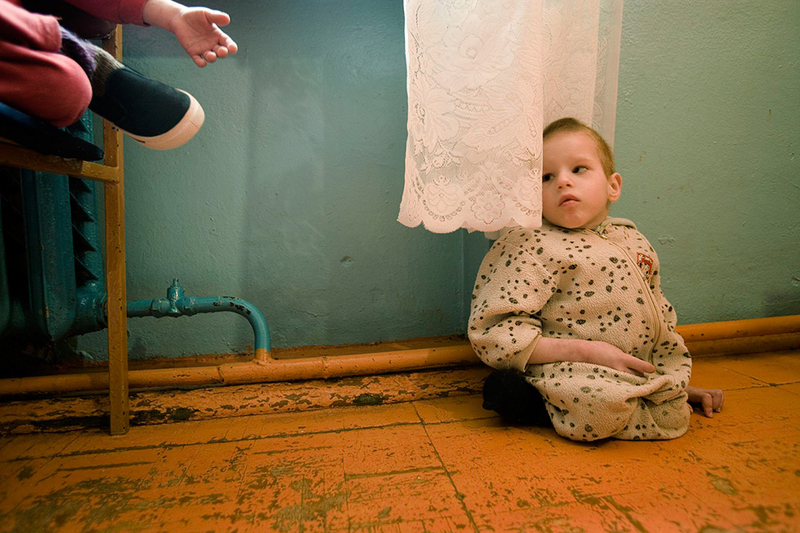 Her mother, Yelena Medeyeva, 29, was born four years before the Chernobyl accident in nearby Chernigov, a city heavily affected by nuclear fallout. According to doctors at the hospital, many patients’ conditions are a direct result of the radioactivity released after the accident. 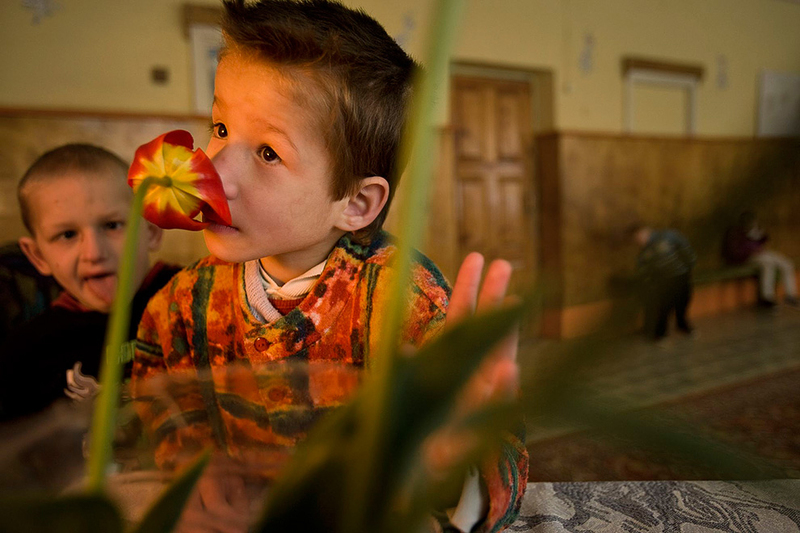 In an orphanage in Belarus, a mentally disabled boy enjoys the scent of a tulip. Children born in the fallout region are said to have a higher rate of birth defects and retardation, a belief supported by many—but not all—in the scientific community. International aid organizations established in the aftermath of the disaster continue to provide much needed financial support to homes and orphanages housing children affected by the fallout. 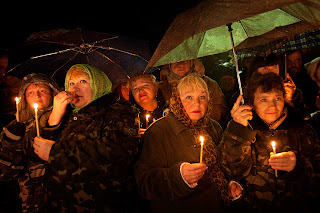 Each year on April 26 in a midnight vigil at the Monument to the Firemen, shift workers in Chernobyl honor those killed by the explosion. Two plant workers died immediately in the blast, and another 28 workers and firemen soon succumbed to radiation poisoning. Thousands more have since died of cancer and the social upheaval caused by mass relocation.